The name of the person you're giving the card to. The name of the person the card is from. The gift card(s) will be delivered to your email account instead of the recipient's, for you to hand deliver or keep for yourself. So we can send the card to you to print it. Available Characters Left characters left. 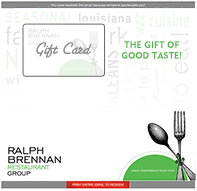 Select E-Gift card (sent by email right away) or a Classic Gift card (sent through the US mail). After you choose a card, simply fill out the form with your billing and shipping information. If you choose a classic card, your order will be processed within 3 business days. Please allow 1 week to receive physical classic gift cards. E-Gift cards will be emailed immediately after purchasing your order. Fed-Ex 2 Day Shipping is available for an additional $15 at checkout.
" Ralph Brennan Named 'Power 20' as one of the 20 most influential restaurant people in the country by Restaurant Business Magazine "